The 35th Infantry Regiment Association salutes our fallen brother, PFC Franklin Bruce Williams, who died in the service of his country on February 4th, 1967 in Binh Dinh Province, Vietnam. The cause of death was listed as Small Arms/AW. At the time of his death Franklin was 21 years of age. He was from Philadelphia, Pennsylvania. Franklin is honored on the Vietnam Veterans Memorial at Panel 14E, Line 120. The decorations earned by PFC Franklin Bruce Williams include: the Combat Infantryman Badge, the Purple Heart, the National Defense Service Medal, the Vietnam Service Medal, the Vietnam Campaign Medal and the Vietnam Cross of Gallantry with Palm Unit Citation. Pfc. Franklin B. Williams, 22, of 2444 Orkney St., was killed shortly after being released from a hospital for the second time with malaria. 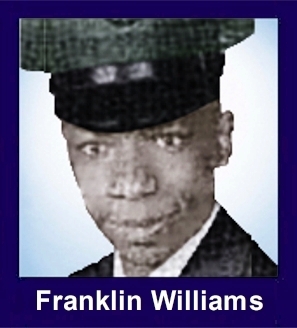 Williams, a graduate of Benjamin Franklin High School, was killed in small arms combat with the Vietcong on Friday. Williams had fallen ill twice with malaria contracted during jungle warfare in Vietnam and had been released from a hospital shortly before being killed in combat.His wife, the former Barbara Allen, whom he married one week before being sent to Vietnam in May, 1966, said she had expected that he would be sent home after being hospitalized the second time with malaria.In addition to his wife, he is survived by his parents, Mr. and Mrs. Depree Williams; five sisters, Margaret, Ann, Mrs. Lillian Lewis, Mrs. Irene Leach, Mrs. Brenda Coleman, and four brothers, Depree Jr., Ralph, Ronald and Allen.